…And We Will Ride On Galaxy Express. Okay. This is hands down my favorite free audio e-book app out there. ...in Japanese. 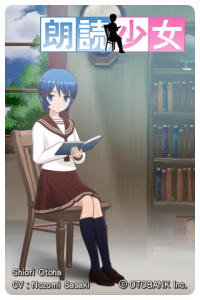 Meet Shiori Otoha; 17 year old high school girl who will read for you. You will first get several pages of Rashomon with the free app, but interaction with her is fully realized. YES! I said interaction! She reacts to your touch, albeit not in the way you're thinking of right now- she's not so responsive to touch since touching her is not the focus of this app. She'll talk about what she likes, what she is thinking, and all that good stuff in a very calming yet shy voice. Her reading voice is excellent. You don't hear any annoying microphone crackling or breathing like with other poorly recorded audio book apps. ...that's MY favorite book too! ...one of many anyway! The library is dark because it changes according to the time of day. When you start the app, she'll say hello according to the time of day, in her cute little animation. Sometimes she'll tell you what she's been thinking. She's not annoying like most anime girls, and that's super great. 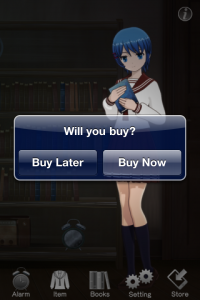 Once you've fallen for Shiori, there's only one thing to do... buy books. They're cataloged in an easy-to-read list. For some reason the price is all listed as ¥, but still charges in US dollars. The list of their collection is pretty enticing though not extensive. But what's even more enticing is, I think, the books in their catalog are Shiori's favorites, like Kenji Miyazawa's writings and other classics. She'll even say that she wanted to read a certain book from the list and will ask if it's a possibility- then the purchase window pops up. I almost fell for it. I almost bought something without knowing what I was getting. This is a dangerous app. Pricing is reasonable too. Some of the longer books are divided into multiple volumes, most of them priced between ¢99-$2.99. Considering the quality, I think this is totally fair. 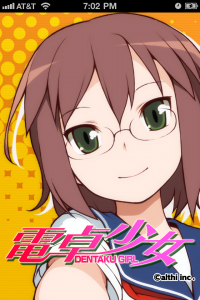 The app also offers items for Shiori for $3.99/item, which I haven't tried yet. Not only are they a bit pricy, I'm almost afraid to get them. This is a very intimate kind of marketing. She interacts with you and builds a kind of relationship. 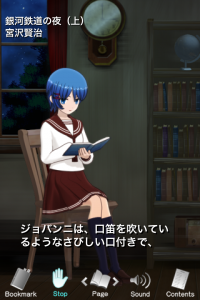 When she reads, the animation is set so that she will gently turn pages, occasionally look up at you while reading as if to make eye contact. I know this sounds silly, but that's what hit the nail on the coffin for me. It wasn't the slight sway of her skirt when she walked. It wasn't her calming voice. It wasn't even her adorable blushing when she talked about her dreams. It was that eye contact, as strange as it sounds, that made her oddly human. Meet Nayuta- 11th grade and adorable math Genius. When you click the above link, you'll get some amusing Engrish as the app description. That's okay. She's still free, and this is one of my favorite free apps out there that actually does something useful. 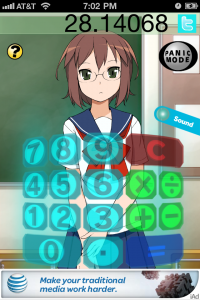 Calculator girl is free, with in-app purchases for her outfit. She is animated, comes with full voice, two outfits (summer and winter school uniform, of course! 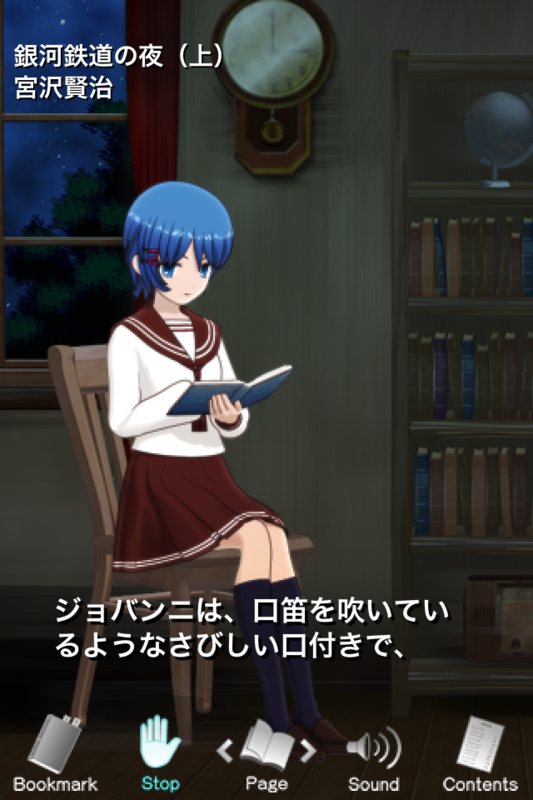 ), various backgrounds featuring classrooms, her room, buddhist temple and more. When you start she'll say a brief hello, and she'll even introduce herself if you play around with it for a while. Of course she also comes with a calculator. She reads out the number you punch in and will read you the answer as well. My boyfriend tried to make music out of her reading numbers, and almost broke her. Don't hurt my calculator girl- she's only trying and she's free. She runs by the power of ads. The app itself is very simple and clean. Calculator works fine. It won't do any kind of higher math, and allows you to have Panic Mode which will give you a simple calculator without Nayuta. Who wants that, right? I don't know how but when I pressed Panic Mode before I started to write this review, she actually moaned(!) but I think there was an update or something and alas, she doesn't do that any more. Ads are a bit of annoyance, but as a free app I don't mind too much. It's the in-app purchases that worry me a bit. Will it get rid of the ads? I highly doubt that, and the price seems to be set per single outfit. I'm not so sure if I can justify the $.99-$2.99 price tag to get her a new outfit... Maybe I should get myself drunk before I make that purchase. Anyway, she's free, she's adorable and a very high quality app. If you want to get her to wear the santa outfit for $2.99 that's your business, pal. This is a sequel to the Regional accent girl alarm (aka Moe Alarm), the boy version. There are four boys with 4 different regional accents varying from Hakata to Kyoto. 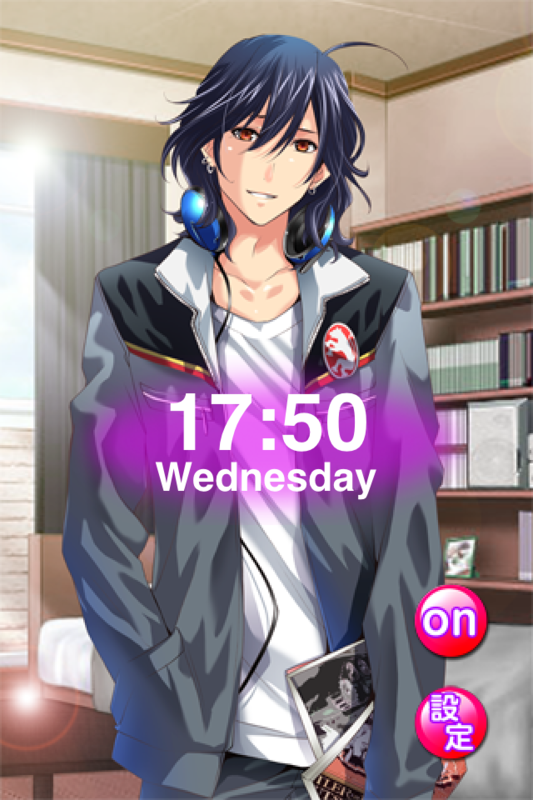 Each male character features two different outfits (signifying two different parts of their day). I was quite impressed that they were actually two different illustrations, not just outfit swap. There are 3 school boys and one businessman. You can use this as an actual alarm, but most of these alarm apps don't let you put the phone in sleep mode to use it. This defeats the purpose of having an alarm app to use as a wake-up device. This problem isn't only limited to this app; in fact, this is one of the BETTER alarm apps of this kind out there. The strong part of this app is definitely the voices. I haven't clicked them enough to cycle through their dialogue library, but it seems pretty extensive and each character has stereotypical (but definitely selling) personalities to go with their looks. Ichii, the nyanyanya boy. 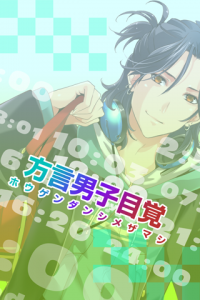 Featured in the main image of this app(above), Ichii speaks in hakata-ben, and definitely reminds me of recent Japanese DS hit Tokimeki Memorial Girl's Side 3rd Story main character in both looks and personality. Trendy! What surprised me with this app is its quality and price. It's only $0.99, and even features after-recording commentaries of each voice actor. Very short, but nonetheless sweet and cute. For those of you who know anything about Japanese voice actor fandom frenzy, you know what I mean. This is a real mini-treat. So go get it. 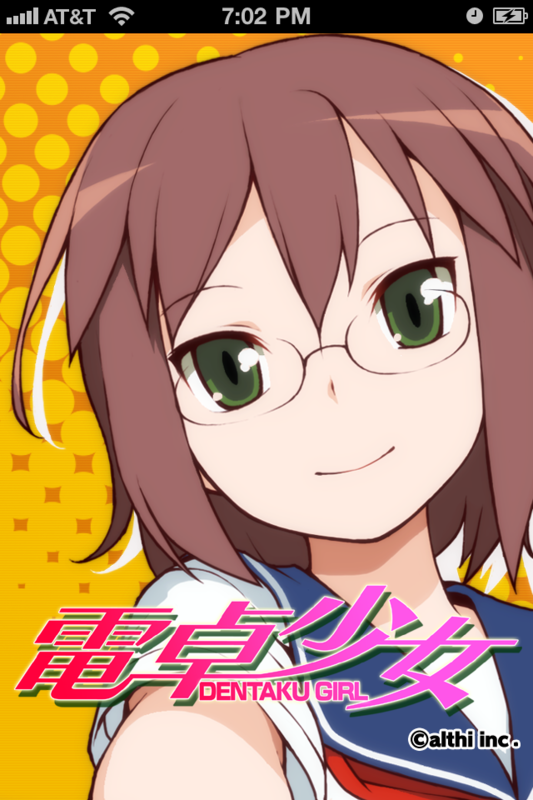 One of the characters from moe alarm. Welcome to Flypup's App Reviews! Our first app review will be kzentertainment's MoeAlarm! Update: Psych! First review is Moe Alarm 2! !